An AV consultant shares his impressions from the largest pro-AV event in the Western Hemisphere. 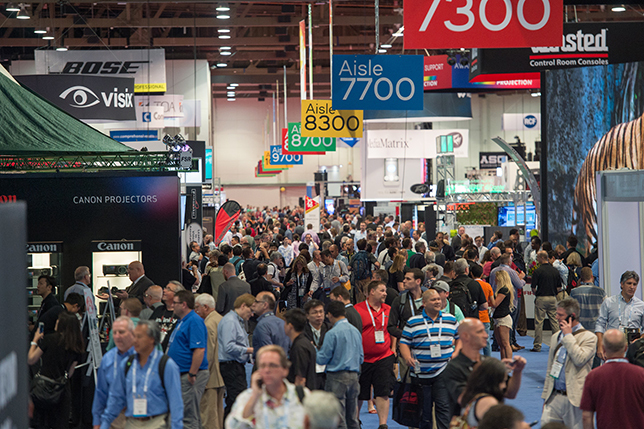 If it's June and you work in audiovisual system design, installation and support, then you either attend the annual InfoComm show, or you follow the news coming out of the show and wish that you were there. The 2016 event was in Las Vegas, and it certainly didn't disappoint — hitting record numbers of attendees and vendors. Plus, more people than ever took advantage of the educational opportunities at the show. Even though I now work in the AV consulting field, much of my show experience mirrored the years I attended when I worked full time in higher ed AV support. Most of my clients are higher ed institutions, so I try to experience InfoComm through their perspective. This year at the show, I concentrated on teaching, networking and building manufacturer relationships. I certainly got to see many new products, but rather than try to race from booth to booth on the show floor, I instead focused on experiencing some of the other benefits of attending InfoComm in-person. I will preface this article by saying that I'm an independent consultant, and I have no financial affiliation with any of the manufacturers I mention in this article, as well as the InfoComm International organization. When I talk to individuals who are attending their first InfoComm, I always start by stressing that they need to take advantage of the educational opportunities at the show. Professional development is key in an industry that is changing as rapidly as the AV industry is, and InfoComm is your best opportunity for industry training. This year is the first that I was a presenter for a couple seminars held during the show. I taught a seminar on ADA compliance in classroom AV design, and another seminar dissecting the various phases of a classroom AV construction project. Both of my seminars targeted academic technology managers. A quick poll of each seminar showed about 90 percent of the attendees were from higher ed institutions, with the remaining 10 percent made up of AV integrators, consultants and corporate AV support staff. Both of the seminars had more than 100 attendees, which was in part due to the fact that InfoComm tried a new seminar package model this year. In past years, we had to enroll in each class/seminar separately, and pay a fee for each. This year, attendees were able to purchase a package that granted attendance to all the Wednesday, Thursday and Friday seminars. This seemed to be a big hit with the large number of attendees participating in the educational opportunities. Normally I take advantage of the InfoComm University classes that are offered on the Saturday, Sunday, and Monday of the InfoComm show week. These are three-day-long classes that offer a deeper dive into subject matter than the shorter seminars offered on Wednesday, Thursday and Friday. If you haven't taken these three-day classes, I highly suggest you look into them. This is an opportunity to learn from some of the brightest AV instructors and professionals in the business, and make some nice networking contacts too. If you're pursuing one of the InfoComm CTS certifications, and you're looking for some classroom instruction to complement your independent study, then look no further than these InfoComm University classes. This year, I didn't end of taking one of these three-day classes only because I already have my CTS-D and CTS-I certifications, and I've taken many of the other courses being offered. I'm hoping that InfoComm adds some new higher-level design and project management classes to their three-day InfoComm University program. Another piece of advice I always give InfoComm newbies is that they need to take advantage of every networking opportunity available during the week. Attend every relevant event, party, reception, committee meeting, etc. that you can get your hands on. With more than 40,000 people attending the show, you're bound to make some solid industry connections. When I worked in higher ed AV support at Harvard University and Ithaca College, I always made sure to attend the annual Technology Managers Reception. This is one of your best resources to meet like-minded AV technology managers at the show. You're bound to find someone from another campus who's in the same boat as you are, grappling with a tricky AV installation or searching for that piece of equipment that will solve their unique AV design issue. Collect business cards like your job depends on it and a few months later you'll be glad that you've built a nice network of industry professionals. Another aspect of networking at InfoComm that many higher ed technology managers overlook is the goal of meeting manufacturer representatives. Many tech managers want to avoid getting the hard sell, so they slip in and out of the booths and remain anonymous. I suggest taking the opposite approach: Walk into the booth, immediately ask if your regional marketing rep is there, and make a face-to-face connection with them. Sure it'll result in more sales calls over the year, but having a direct contact at the manufacturer is a great resource for product and technical questions. Even as a design consultant, I rely on my manufacturer marketing reps heavily. During the year I constantly contact them with design and technical questions, and at InfoComm I try to schedule 30-minute booth tours with them. OK, I get it, everyone wants to hear about the new and exciting products that were premiered at InfoComm this year. Unfortunately, it's just not like it used to be. In the past, all the companies waited until the show to introduce their new products for the year. This doesn't seem to be the case anymore, with manufacturers releasing products all throughout the year — and even the products premiered at InfoComm are usually preceeded by a "sneak peek" press release a week or two before the show. My goal on the show floor isn't necessarily to hunt down the new and exciting products, but rather to get my hands on products that I need an in-person demo to experience. I'm talking microphone and speaker demos, projector and flat panel display shootouts, and other equipment that can't be evaluated just by reading a cut sheet back in the office. I also like to find manufacturers that may not have the flashy and exciting products, but have the products that will make my life easier as a system designer. Products like unique display mounts, equipment rack accessories, under-table or in-ceiling equipment storage solutions, etc. Head to the back of the show floor to find those smaller companies. I think we can all agree that the AV/IT convergence has happened, and the premiere products at the show this year certainly exhibited this. The AV industry is all about moving audio, video and control signals over the network, using proprietary or standards-based methods. The audio section of the show floor has always been a bit stale in past years, with very few groundbreaking advancements (compared to the video world), but this year you couldn't help but notice the mention of Dante everywhere. Even though this was pretty evident at the show last year, this year's plethora of Dante-enabled devices secures their place at the top of the heap when it comes to networked audio. One Dante-enabled product line that caught my eye was the new audio DSP offerings from Crestron. The company premiered its new Avia line of DSPs, with all the features I'm looking for in a classroom/conference room DSP: AEC, USB interface, Dante connection, VoIP (SIP) connection and control system integration. Crestron has an uphill battle to turn users away from their preferred DSP manufacturer, but with all those features and a design team lead by audio industry veteran Dennis Fink, I think they'll have some success. Another Dante-enabled product line that I made sure to experience a demo of was the Shure Microflex Advance ceiling mic array and table mic array. The mics have Dante outputs, and depending on the model, offer on-board DSP features like echo reduction, steerable coverage, auto mixing and EQ. Even on the noisy show floor, we were easily able to steer the ceiling mic coverage over to pick up our voices. Sticking with the networked AV theme, QSC's Q-SYS AV-to-USB is another new product that I think is very useful for classroom and conference room AV systems. In a nutshell, the company is expanding on its Core 110f DSP to now integrate IP cameras and a USB interface. If you've ever struggled with a classroom or conference room web conferencing system design that consists of a bunch of USB extenders, a USB hub and/or switch, control issues, multiple camera switching challenges and poor audio processing, definitely take the time to learn more about QSC's offerings. I was happy to see that Crestron will be offering DigitalMedia compatible patch panels and premade cables. The AV industry loves to rely on direct cable runs between field devices and rack equipment, with field terminations of male RJ45 connectors. For years, IT standards have dictated that structured cabling needs to terminate at punch-down jacks and patch panels, rather than direct connections between, for example, wireless access points and the network closet switch port. Crestron's new DM patch panels and pre-made cables will help to push AV system designs toward tried and tested IT structured cabling standards. Another product that rose to the top of discussion at the show is Biamp's TesiraLUX encoder and decoder, which will support video distribution using the AVB standard. Biamp had previously incorporated the audio portion of AVB into its Tesira DSP line, and now will show that video can be transported over a network using AVB. The idea that someone has finally figured out the "V" in AVB is exciting, but I really need to experience this product firsthand before I can consider incorporating it into my system designs. I'm not totally sold on the idea of AVB being the future of networked AV, so I'm interested in watching how this all plays out. One last product offering that I took notice of is Middle Atlantic's DC Power Distribution solution. If your AV equipment racks are full of power supplies (wall warts) and power strips for all the smaller devices, then you can look to this product from Middle Atlantic to clean things up. This is a 1RU device that offers different common DC voltage outputs on phoenix connectors, replacing all the individual wall warts. It's one of those tools that will make your installers happy.